CC has been building up quite the reading list this summer. She just finished "The Witches" by Roald Dahl, and she also checked off one Judy Moody book, one of the Magic Tree House books, as well as a Ramona Quimby favorite. And while I love it when she reads chapter books -- particularly ones that challenge her -- I also just love to see her reading. Period. 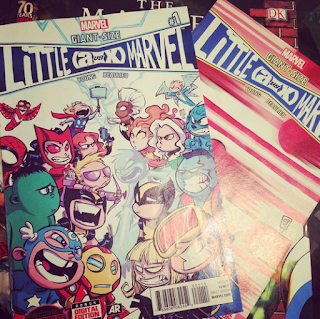 Her latest favorite is Giant-Size Little Marvel Comic Books ($3.99 each) from Marvel Comics. 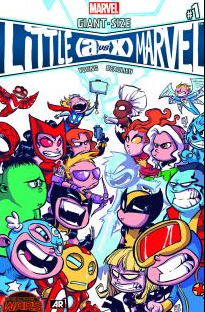 This new series, created by writer/artist Skottie Young, has pint-sized Avengers superheroes hanging with the mini X-Men gang. Except they're not exactly friends. In fact, the two groups tend to get into a lot of playground skirmishes. Only these skirmishes involve explosions, (un)natural disasters and lots of cool superpowers. Little versions of The Hulk, Black Widow, Captain America and more take on Magik, Wolverine and Rogue for some seriously kid-sized fun. And while some of the action takes place of the streets of Marville, the town where they live, kids will also recognize familiar school-centric scenarios. The Hulk needs to go to the bathroom during class, Magik's mom calls her home for dinner just as she's standing up for herself, and Marvel Ball (aka Dodgeball) has the kids picking favorites for their teams. All of that is totally relatable to elementary-school children. While there is some comic-book violence and serious sass, the short books are rated T, which is the Marvel version of PG. The books are appropriate for most readers, but Mom and Dad might want to read them over first. So far, there are three comic books in the series, with #4 hitting shelves September 9. Expect to see little Guardians of the Galaxy and the other two gangs comparing toys.